Long flowing navy spaghetti strap top. Super soft. Slightly darker stripped pattern. 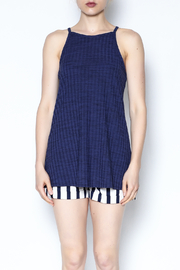 Stripe spaghetti strap, soft knit top. Ruffle on the top with horizontal stripes, while the body are vertical stripes. Blue and white in color. Wrinkle free fabric, must hand wash in cold water, hang to dry.